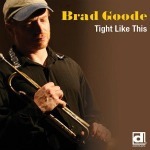 Brad Goode, Tight Like This (Delmark). During his Chicago days, Goode worked through his influences, notably Dizzy Gillespie and Clifford Brown, into early individuality. He has a Gillespie moment during his muted solo on the exotic 1942 Xavier Cugat song “Nightingale,” but it’s a rare example of his playing a direct quote. Goode has serious fun exercising his trumpet virtuosity. Creativity and taste balance his technical skill so that his smears, swoops, glissandos, flawless interval leaps and notes in the stratosphere serve the music. Louis Armstrong’s solo on “Tight Like This” (1928) and Bix Beiderbecke’s on “Changes” (1927) are among the early milestones of recorded jazz trumpet. They may have had an effect on Goode, but it would take microscopic analysis of his playing on those tunes to turn up traces of anything resembling imitation. His approach on “Tight Like This,” while spectacular and often high above the horn’s normal range, is relatively conservative in content. Elsewhere, it’s another story. In their solos on “Changes,” both he and pianist Adrean Farrugia go adventuring outside the borders of the harmonic structure, abetted by bassist Kelly Sill and drummer Anthony Lee, who shine throughout the album. In other familiar material, the four often loosen or tighten the time within set tempos. Their elastic rhythmic collaboration produces stimulating tension and release in Irving Berlin’s “Reaching For the Moon.” 1940s trumpet icon Freddie Webster’s “Reverse the Charges” finds Goode puckish in a muted workout on slightly altered “I Got Rhythm” changes. Lee’s drum commentary punctuates Sill’s spirited solo on the piece. Farrugia constructs a solo mainly using fragments until he builds into full employment of both hands and displays a rich harmonic imagination. With the rhythm section surging in a fast ¾ treatment, Goode floats into “Softly, As in a Morning Sunrise” to create a solo of remarkable fluidity and continuity of ideas. He plays his ballad “Midwestern Autumn” muted and close to the microphone in a mood of reflection. The progressive harmonies of “Climbing Out” allow freedom that Goode and Farrugia revel in, with the trumpeter making joyous octave jumps. “Summary,” “The River” and “Bob’s Bounce” are additional evidence that Goode is a composer of substance as well as a formidable improviser. This band deserves attention. It rewards close listening.